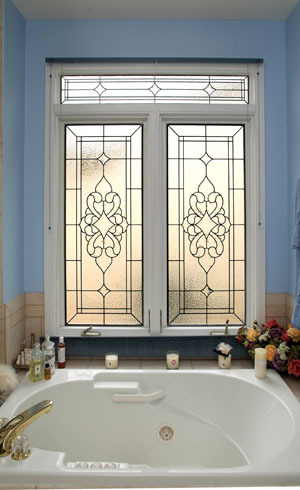 Bathroom stained glass windows are one of our most popular choices for practical as well as aesthetic reasons. 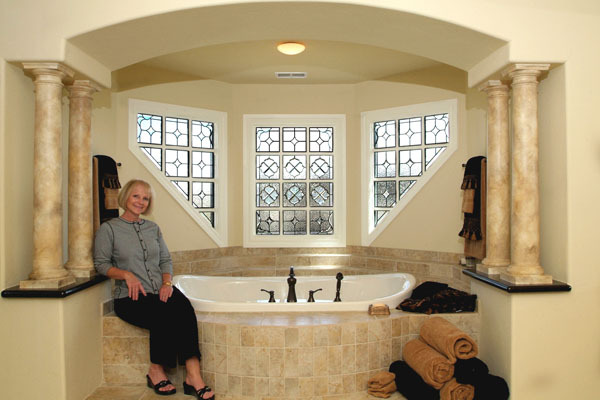 In many bathrooms, large windows overlook the bathtub, while smaller bathroom windows often lend light to the vanity or shower. 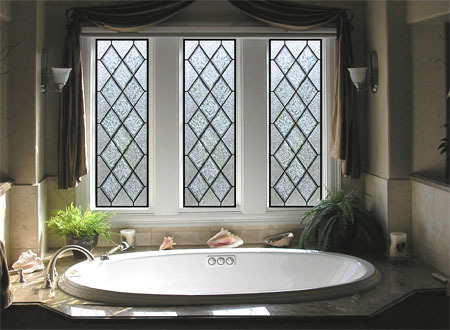 While these windows are great at allowing light into your bathroom they also reduce your privacy. 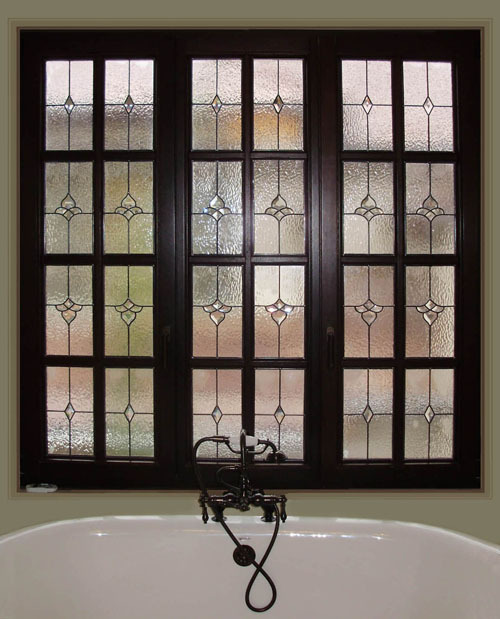 Putting blinds or other window covers means climbing in and out of the bathtub a couple of times a day to control the light and the privacy, and in the end the homeowner will get tired of this and just keep the blind closed permanently, thereby losing all the daylight. 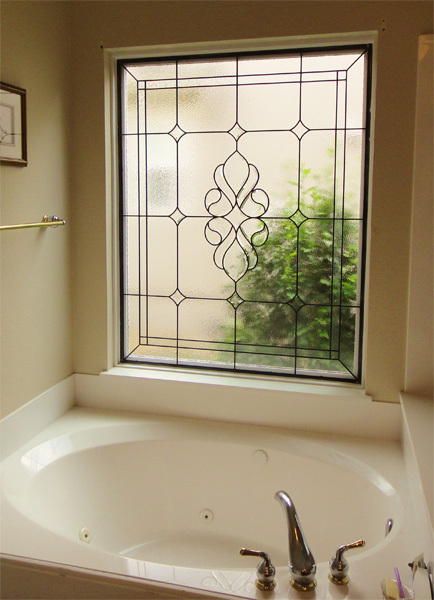 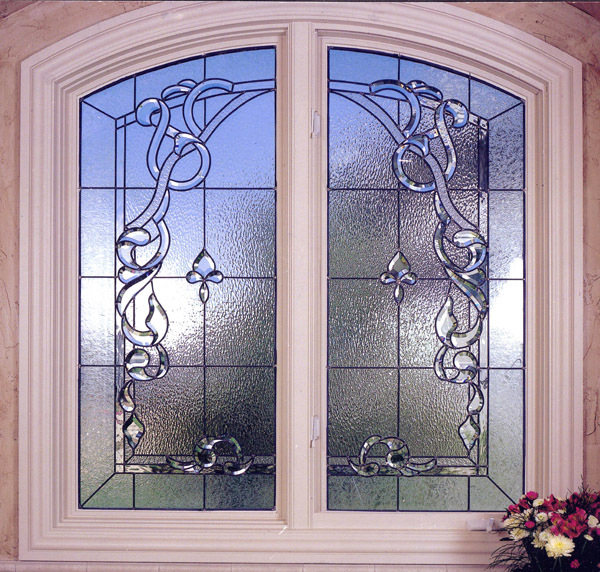 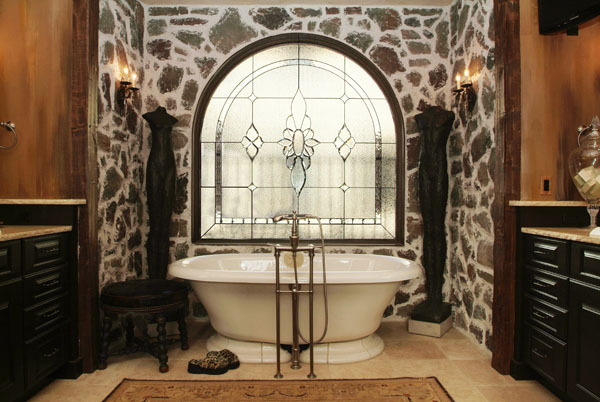 Installing leaded or stained glass panels in the bathroom window offers a great solution. 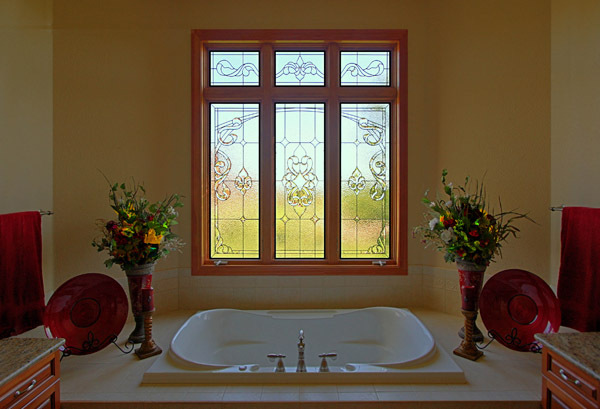 It will not only look beautiful, it can also provide all the privacy that’s required while letting in natural daylight allowing the room to feel brighter and more open. 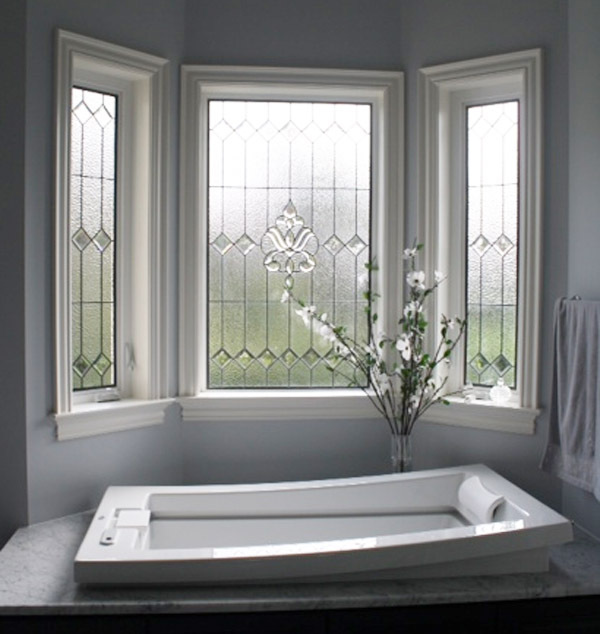 In addition, the colors of the tile and other bathroom accessories will be accented by the natural colors created by the stained and leaded glass in the daylight. 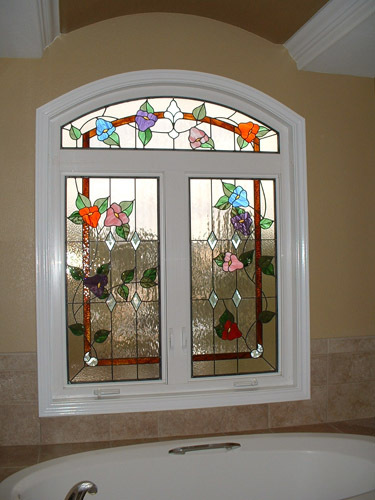 We can fit your new stained glass piece into your current window frame, or create a entirely new window along with a new frame. 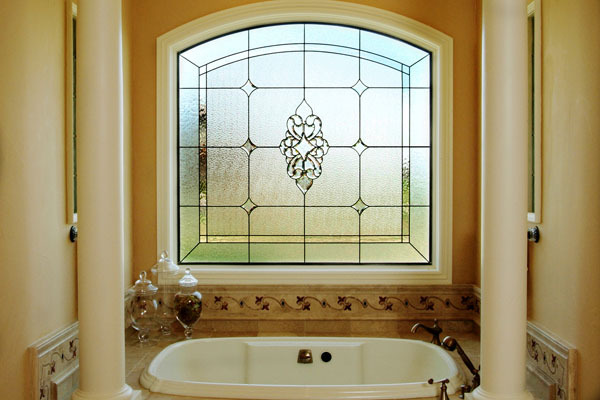 We offer the highest quality glass and window products, so you can feel confident about your Scottish Stained Glass purchases. 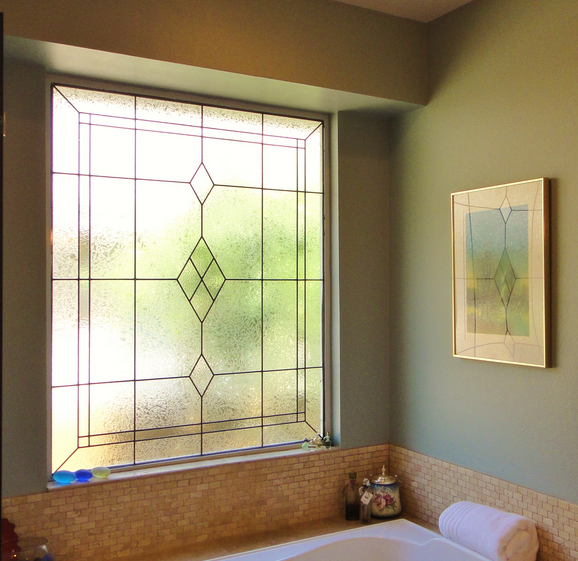 You spend time in your bathrooms both preparing for you days, and unwinding from them, so why not make them more beautiful and relaxing with a work of art? 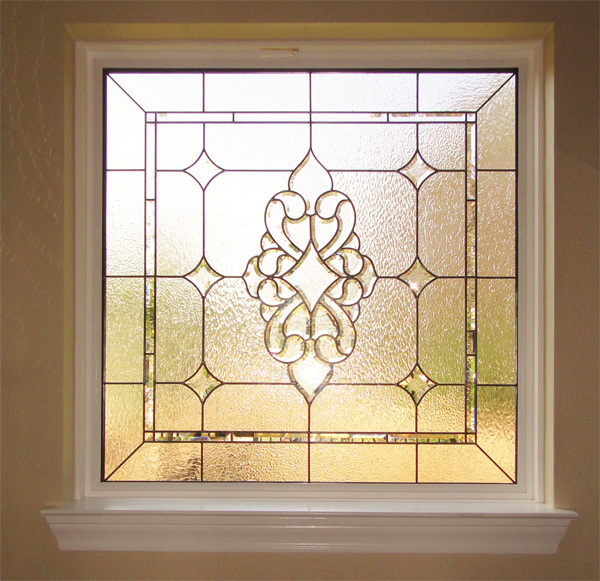 Our stained glass options give you the power to build something completely in tune with your personal taste, while giving you the peace of mind of certain privacy. 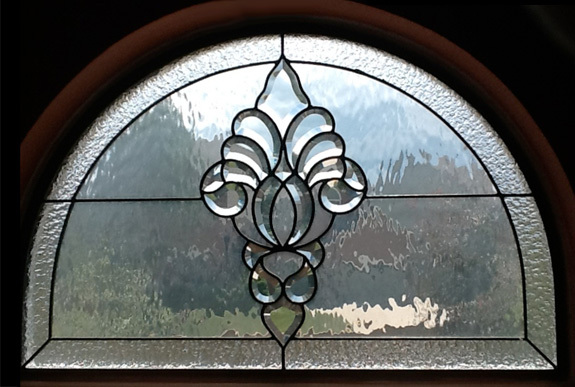 Each custom stained glass piece we create is completely unique to our clients’ many styles and tastes, so our designers will work with you to create something perfect for your particular case. 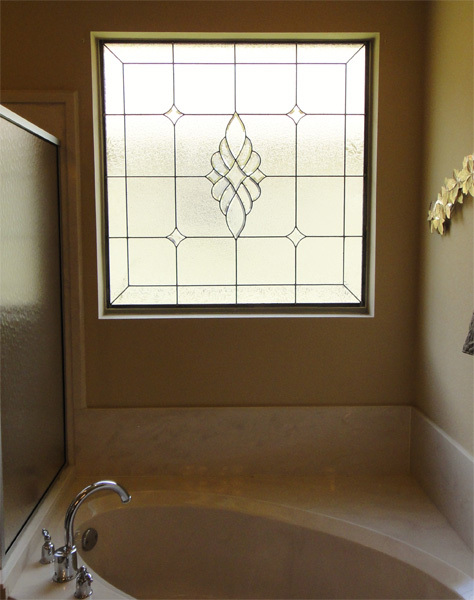 Adding Scottish Stained Glass to your bathroom gives you another outlet to make this room all your own, and add a beautiful personal touch that will actually increase the value of your home. 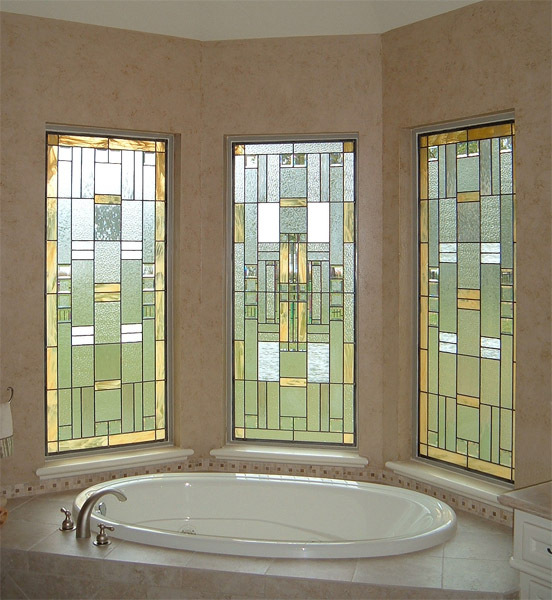 Other bathroom stained glass applications include shower windows and even leaded glass between two areas in the bathroom such as a shower room and the main bathroom area. 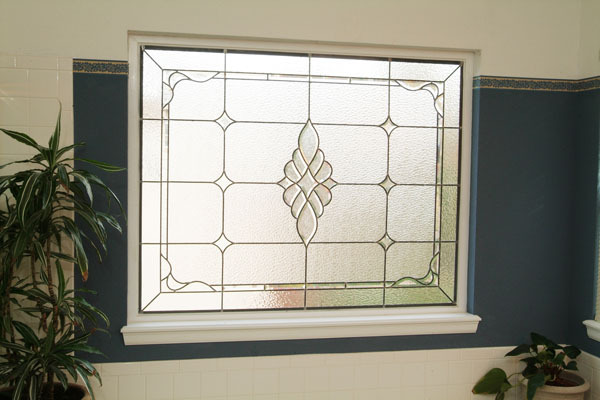 In cases where the shower has a window which has direct and repeated contact with water, Scottish Stained Glass has developed a water-proof method to seal the leaded glass inside the two panes of the double pane window to ensure the leaded glass never comes into contact with the water jets. 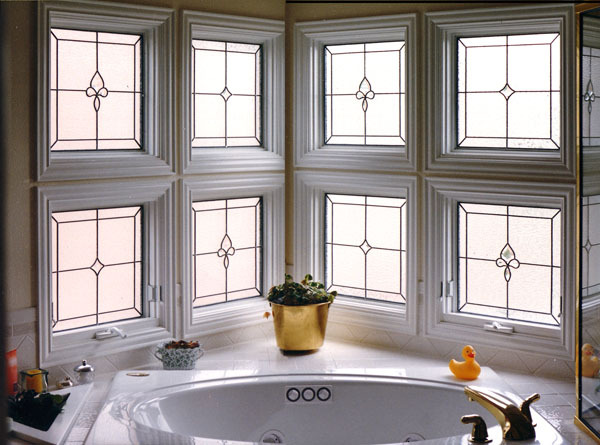 This also makes for easy cleaning and complies with all building code regulations. 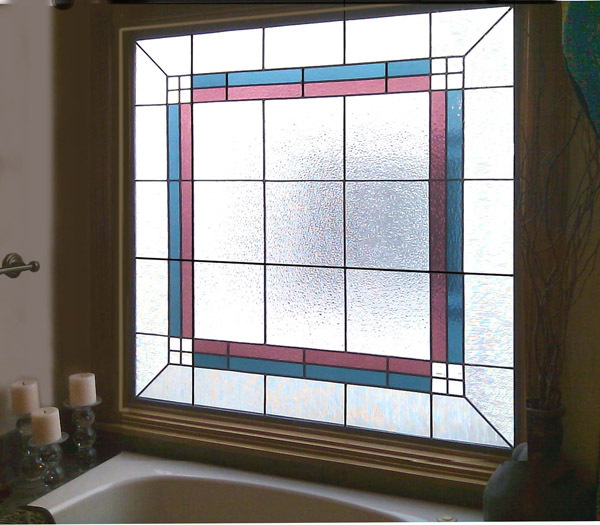 All stained glass window designs bathroom windows are custom made to be affordable, and built using the unique Scottish Stained Glass methods of excellence. 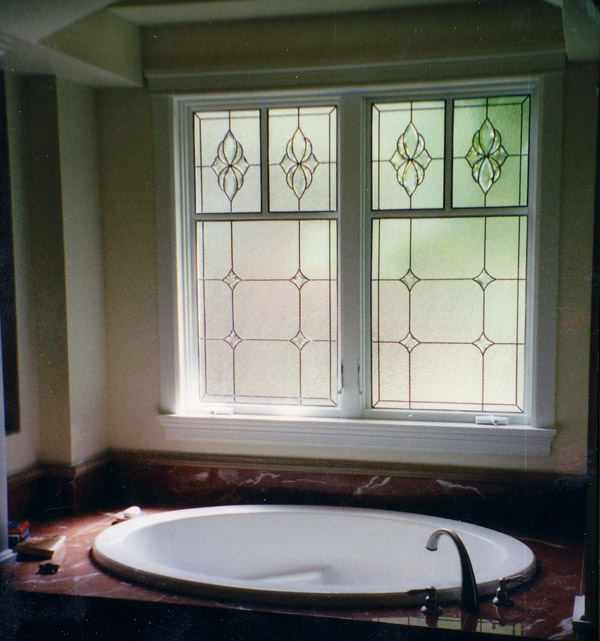 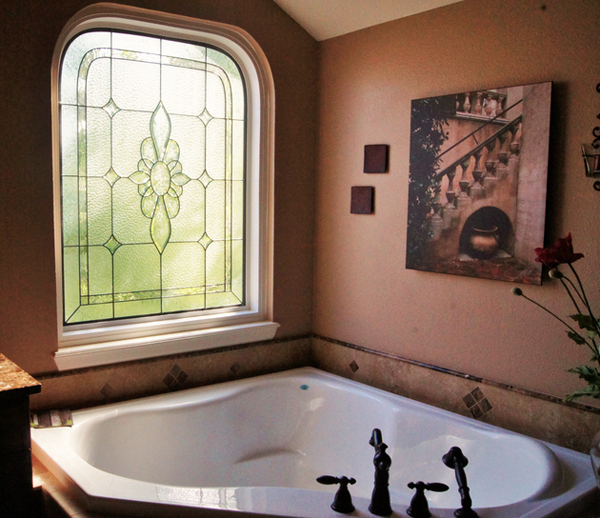 To see more, check out our complete gallery of stained glass bathroom windows.